Located on Deck 8, Chops Grille on the Oasis of the Seas awaits you. This classic, five star restaurant is perfect for special occasions, and your wine list at Chops Grille is the best to be found on your cruise! Tuna Tartarre and crab cakes are among appetizers, and your main entree choices include Filet Mignon, a variety of cuts of steak, fish, and grilled meats. The sauces for your steaks, such as peppercorn, wine reduction, and bearnaise, are very much worth your while! Desserts on your menu include the Mississippi Mud Pie (which receives excellent guest reviews) and Apple Pudding. 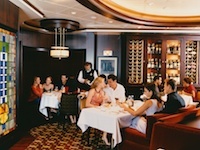 The Chops Grille is one of the most popular restaurants on the Oasis of the Seas, and, reservations are required. It is advised that you book early as the Chops Grille will sell out. You can make reservations as soon as you board the ship; however, the best way is to make them when you do online check-in well before you get on board the ship. There is a 39 USD charge per diner at Chop's Grille. On Deck 15, the Solarium Bistro on the Oasis of the Seas provides upscale complimentary breakfasts and lunch buffet. Dinner at your table is 20 USD per person. Here you'll find gluten free bread, shrimp, salads, vegetarian entrees, Ratatoulle baked in eggplant, soups, salmon, a variety of side dishes, and a dessert buffet among other menu choices. Check when aboard for hours. Across from Johnny Rocket's on Deck 6, Sabor Taqueria and Tequila Bar offers a simple but delectable choice of entrees that include quesadillas, tacos, burritos, and dinner entrees. The tortillas and chips are homemade, and the guacamole is created fresh for you at your table. Mole short rib, Tiger Shrimp, Oaxacan Red Snapper Ceviche, Queso Fundido, Pollito Quesadillas, and Barbacoa Tacos are among the a la carte entrees on the Sabor menu. While the Sabor is not a complimentary venue, it receives wonderful reviews! Starboard aft on Deck 12, in retro '50's atmosphere, enjoy burgers and fries among other diner treats for 6.95 USD. If you haven't heard of them, Johnny Rockets is the land-based hamburger chain that is a feature of many major tourist destinations. As far as hamburgers go, Johnny Rockets on Royal Caribbean are some of the best you will find at sea (the milk shakes and fries are rather good as well). The whole Johnny Rockets experience is fun -- from the individual jukeboxes and old-fashioned soda-fountain straw stands at each table to the waitstaff and cooks who regularly get up and dance to certain songs from the '50's and '60's, Johnny Rockets on the Oasis of the Seas is a great casual dining venue. 150 Central Park on Oasis of the Seas is the finest dining experience offered on any Royal Caribbean ship. Gazpacho, braised beef, salmon medallions, duck, sea scallops, cheese selections, vegetarian dishes, and desserts are exemplary of menu items for 40 USD per person at this upscale Manhattan restaurant. At additional cost, there's a 6 course dinner with wine pairing which receives great guest reviews! Dress for 150 Central Park is more formal than casual. Gentlemen will feel most comfortable in suits. Zuppa, Antipasti per Due, Focaccia al la Giovanni, pastas, ravioli, pepper crusted tuna, chicken breasts, and veal main entrees and desserts such as mascarpone mousse and cannoli are sample menu items at Giovanni's Table on the Oasis of the Seas. Lunch is 20 USD and dinner is 25 USD per person at Giovanni's Table. Smart casual attire is recommended. Giovanni's Table receives good reviews for food quality and staff service. A la Carte signature rolls on the of Oasis of the Seas' Izumi Japanese restaurant menu. The sushi rolls include Snow Crab California, Box salmon & Crab, Box Yellowtail Tuna, Shrimp Tempura, and Champagne Salmon. Food and beverages at Izumi are at current menu prices. We suggest smart casual attire, and that you check when on for hours open. Diner treats for 4.95 USD at Johnny Rockets. Lunch is 7.95 USD per person, and dinner is 9.95 USD at the Seafood Shack. This is a dinner only experience from 6:00pm to 10:00pm. You'll feel most comfortable at the supper club in elegant attire on formal evenings, but otherwise smart casual is suggested. How much should I tip at Chops Grille, Solarium Bistro, Seafood Shack, 150 Central Park, Giovanni's Table and Izumi Japanese restaurant on Oasis of the Seas? First, bear in mind that all alcoholic beverages that you pay for will have a gratuity added. The cover charge does include gratuity; however, you may wish to consider giving an extra gratuity to the waiter or waitress who has served you. An appropriate amount is to estimate the value of the meal you ordered if you ordered it on land and tip 15-20% based on that cost. If you feel that the value of the meal was $50 were you to order it in a land-based restaurant, you should tip $7.50-$10. It is certainly your discretion not to tip, but the waiters serving you are some of the best on the ship and should be rewarded if they provided you with an exceptional dining experience.